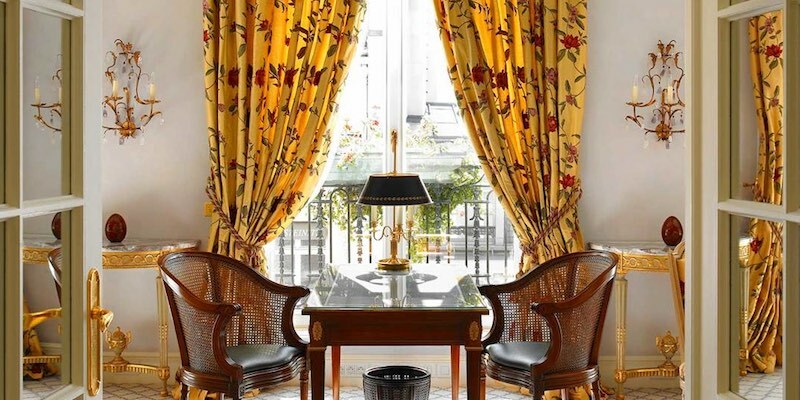 For nearly a century, the Hotel Bristol Paris has been an institution on the fabled Rue du Faubourg Saint-Honoré. It's also one of the few luxury hotels in the world that has two cats on its payroll. Kleopatre & Fa-Raon roam the the lobby, lounging on Louis XVI sofas. 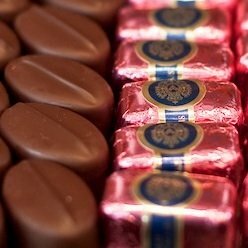 They have come to symbolize the homey atmosphere that Le Bristol seems to achieve effortlessly. But there's really nothing effortless about retaining the hotel's designation as a Palace, the highest accolade achievable in France — it's hard work by dedicated staff. 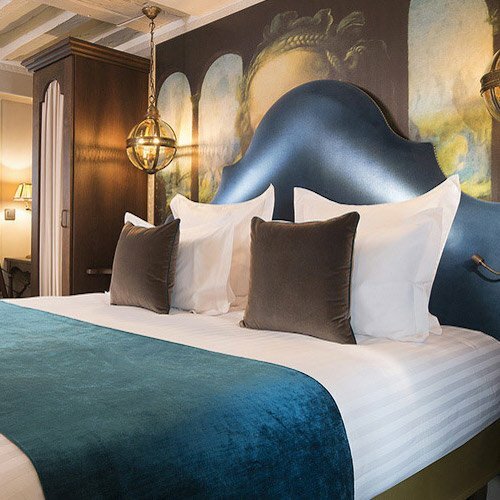 Elegant, oozing with French charm, luxury, and perhaps the best customer service in all the land, Le Bristol may be le plus chic, le plus discreet hotel in Paris. 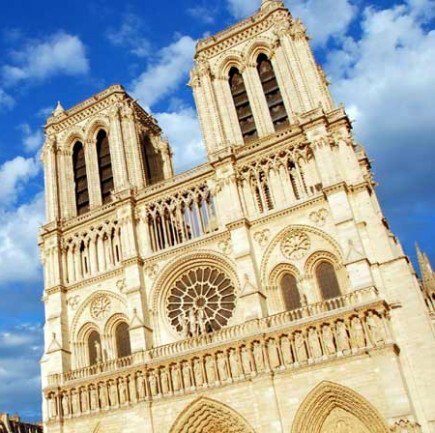 There are 188 luxury rooms, many of them overlook the inner courtyards, a few have Eiffel Tower views, and all are sound-proofed from the noise of the street. Rooms have a feminine touch with floral fabrics integrating the hotel's trademark colours, verdant green and dark pink..
Each room is finished with a classic mix of chandeliers, Regency-style furniture and neutral walls. The bathrooms are spacious, with pale marble and large showers and deep soaking bathtubs. Choose from Superior, or Deluxe, or the most spacious rooms, Prestige. But, if you really want to go luxe, go for the Imperial Suite. Spanning 3,445 square feet (340 m²), the Imperial is the Bristol's largest suite. The dining room, with Versailles parquet floors, overlooks the French-style garden and can accommodate up to twelve (lucky) dinner guests. The furniture is from Maison Taillardat; they make luxury furniture based on 18th-century designs. 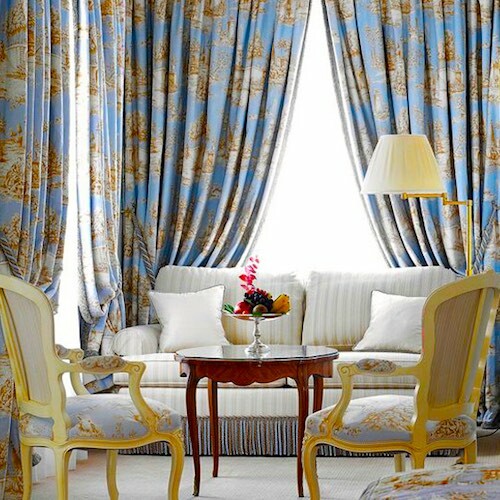 The fabrics are from Manuel Canovas who specializes in French luxury weaves and prints. On the walls are paintings from the 18th century French rococo painter Jean-Baptiste Pater (1695-1736). Bathed in natural light, the main bedroom is decorated with fine silks from Veraseta. It also has a lounge area and a large walk-in wardrobe. The suite's spacious bathroom overlooks the hotel's interior garden. The suite's second bedroom is decorated with sky blue floral fabrics and has a separate lounge area which is decorated with antique prints and masterpieces, including a watercolour from the 19th-century English painter William Henry Hunt (1790-1864). 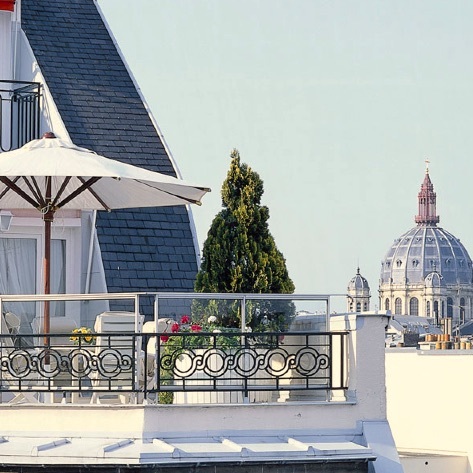 Terrace Suites – with an outdoor garden that overlooks Paris. Penthouse Suite – with a private terrace and views of Paris rooftops. 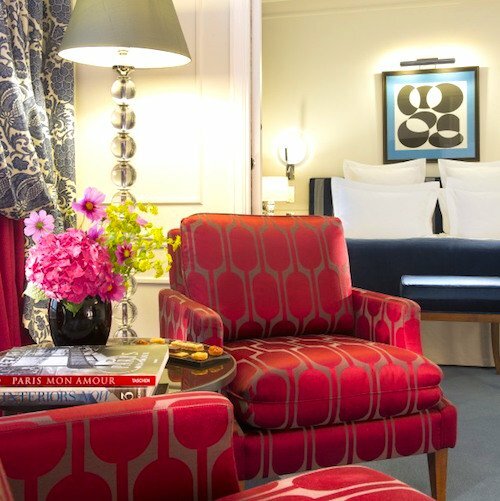 Panoramic Suite – This is the suite used by Woody Allen for Midnight in Paris. 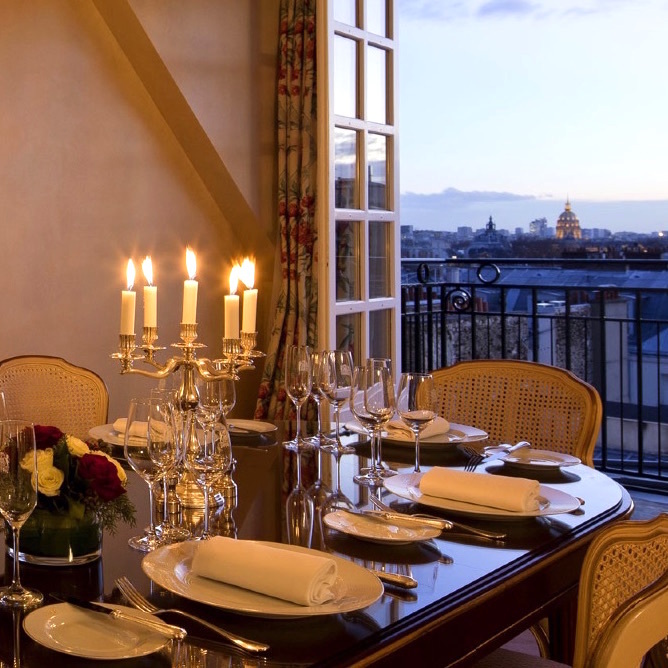 Paris Suite – Located on the sixth floor with Eiffel Tower views. Pinciere Suites – Recreates a private 18th-century townhouse. Royal Suites – 3230 square feet suites overlook le Bristol's garden. Honeymoon Suite – A private apartment on the 8th and top floor of the hotel. The multi-level spa is filled with natural light and fresh air, especially if you book a treatment in a private garden terrace room. Sone of The Duo cabins come with their own Turkish or whirlpool baths and a private balcony terrace. Starting in 2010 a lengthy $130 million facelift restored a youthful, lighter glow to the 85-year-old grande dame. While much of 19th-century French regalia remained — French fabrics and gilded ceilings that date to pre-1925 — the new Bristol enhanced its best assets. The views from the Eiffel Tower rooms were expanded with floor-to-ceiling windows. The Epicure restaurant was completely redone with romantic tables overlooking the leafy courtyard. New touches in the suites are paintings by French masters, a private gym, and a lavender and white bedroom. The hotel also added two apartment-style suites, reachable only by an original wrought-iron elevator. One feature that didn't change is the historic main elevator designed by Jewish architect Leo Lerman during World War II. Lerman spent the war years hiding in the Bristol, designing rooms and the elegant ironwork cage elevator. The good news for Lerman was that the Bristol was one of the only hotels in Paris not taken over by the Nazis during the German occupation. There's little disagreement that Epicure is one of the best restaurants in Paris. 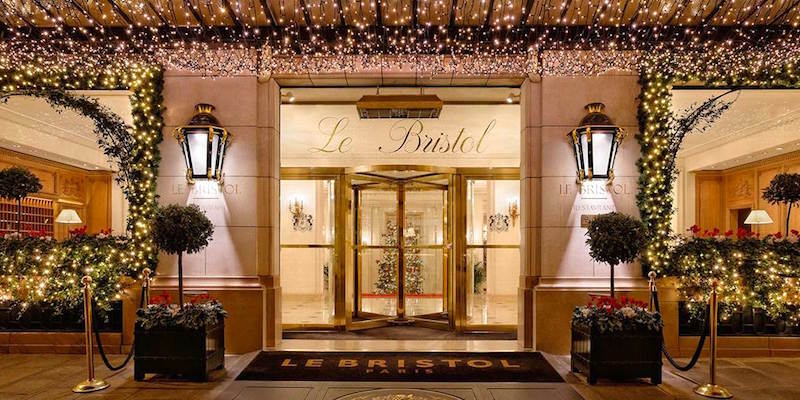 And even if you can't afford to stay at Le Bristol perhaps you can splurge on a multi-course tasting menu that will only set you back a few hundred Euros. Epicure's dining room overlooks the courtyard and doubles as the breakfast room. The more casual dining option is the hotel brasserie, 114 Faubourg. Popular as a lunch spot for locals and hotel guests, 114 Faubourg has a Michelin star of its own. Before it was taken over by the Bristol, it was a bank; what used to be the safe is now the wine cellar. The tasting menu at 114 Faubourg can be had for round about 100€. Cozy up in the old-world charm of the Le Bar du Bristol and order one of their signature cocktails: the Old Fashioned N°10 with 12 year old rum, coconut and cane sugar, Provencal Daiquiri with Havana Club rum, lime, lavender bitter and cane sugar or Rhubarb Fizz with Belvedere vodka, lemon, rhubarb juice egg white, and lemonade. Along with the drinks order a few tapas — blinis with caviar and sour cream, foie gras toast or shrimp tempura. Le Bar is open seven days a week from 5:30 PM to 2:00 AM. "I'm a control freak," says Eric Frechon. 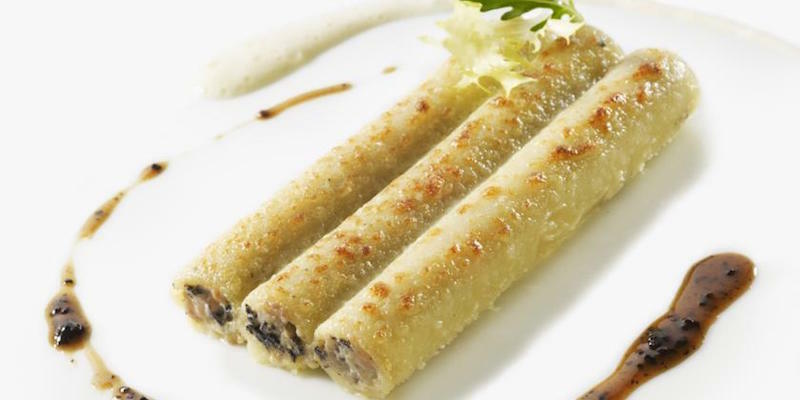 Frechon loves to use common ingredients like mackerel, chicken and then elevate them using complex techniques. One of his specialities is whole roast chicken, cooked at a low temperature in a pig's bladder, with a few truffles hiding beneath the skin. Frechon loves cuisine from all over the world, and has a soft spot for Thai street food. If he wasn't a chef, he's said he'd be a cabinetmaker or locksmith. His daily inspiration is to walk through the Marché d'Aligre in Paris. He was born in 1963 and has spent most of his life working in restaurants. The hotel started life as a private residence for French dandy, Jules de Castellane, during the Second Empire period under Napoleon III. Thankfully, the idea of demolishing his mansion was opposed and in January, 1925, the Hotel Bristol opened its doors. The man behind the legendary hotel's beginnings was Hippolyte Jammet, who held the reins between the Roaring Twenties and World War II. Today, the hotel is privately owned by one of Europe's wealthiest families, the Oetkers. In 2011, on the heels of their massive renovation, the Bristol was the first Parisian hotel to be awarded the Palace status by the French Ministry of Tourism. In 2016, they once again received the Palace distinction and will keep it for at least the next five years. In 2016 the Epicure received the Wine Spectator Grand Award, recognizing the best selection of wine in the world. 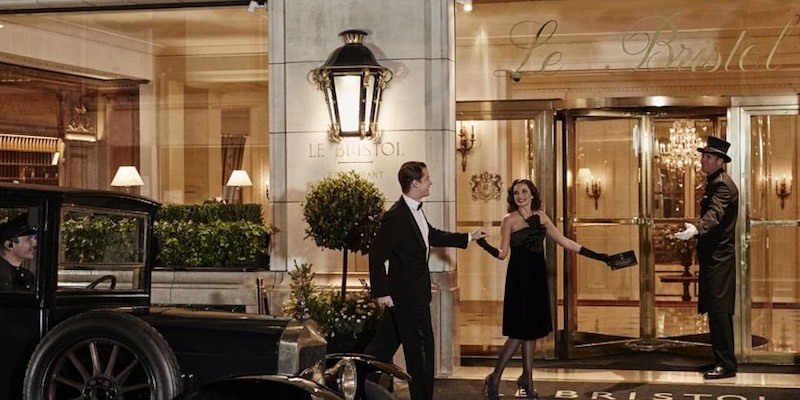 Travel+Leisure magazine has also name the Bristol the world's best in the following categories — Best Hotels in the World, Best City Hotels in Europe, and Best Hotels in Paris. There is a team of eight full-time painters that tend to each and every detail throughout the Bristol. There are four separate cellars holding 100,000 bottles of wine. In-house bakers produce eleven different types of bread per day. All the artwork in the hotel are originals; most are from the 18th century. There are no magnetic room keycards. The hotel still uses traditional keys, manufactured in 1925 by locksmith Jean-Arthur Fontaine. Sonia Papet was the first woman to be awarded the title Chief Concierge of a Parisian palace. The Bristol was number seven on the list of 22 Great Places to Work in France.